HC Supplies are the go-to designer kitchen sinks stockists. When refurbishing your home, it is important to select a kitchen sinks basin that will be a pleasure to look at each day. It is essential that your own personal style is taken into consideration when contemplating kitchen sinks, and sometimes it can prove difficult to find precisely what you are looking for. However, as we offer such an extensive range of kitchen sinks, we are certain you will find an assortment of the sinks that you simply can't do without. Transform your kitchen into a modern masterpiece with discounted kitchens sinks from HC Supplies. Does your flat need something special to bring it up to date? Opt for one of the Smeg Alba Stainless Steel kitchen sinks with its gleaming curves and its neat, solid bowl. Perhaps you have a thing for nostalgia and want to be whisked away to the turn of the 20th century each time you enter your kitchen? Purchase one of the new kitchen sinks from Astracast and enjoy its sleek, yet sturdy design. For sinks, kitchen design, choose HC Supplies. The Sinks, Kitchen and Designer Sale! When it comes to choosing kitchen sinks, kitchen design is perhaps where most people begin, but you may be finding it difficult to source many different styles all in one place. However, here at HC Supplies we accommodate all sorts of tastes, from the traditional to the contemporary, so there is no need to browse an abundance of sites selling kitchen sinks. Our search mechanism makes it simple to discover the types of kitchen sink basin you require, and if you don't know where to begin, simply browse our entire collection. The kitchen is often referred to as the heart of the home, and with good reason. It is the place family and friends gather to cook, drink, socialise and sometimes even just relax. Such an important space should be treated to the fixtures and fittings it deserves, and what better way to begin than with a designer kitchen sink? Many of our customers are surprised at just how cheap our designer kitchen sinks are, especially as we stock big brand names such as Smeg, Bretton Park, and Astracast. However, we are pleased to be able to make stylish kitchen sinks affordable, by, in many cases, offering them at a fraction of the recommended retail price. Our range is extremely varied, with an assortment of kitchen sinks in many different materials. You may like the appeal of a stainless steel kitchen sink due to its durability and timeless design, or you may prefer a more vibrant option such as a Corian Trevino kitchen sink in Bisque, Tan, or Elegant grey. HC Supplies also recognises the importance of stocking different sizes of kitchen sinks, and we ensure we include the measurements of each sink featured in the detailed description. Should you be unable to find the precise size or style of sink you were looking for, contact our customer services team and we will endeavour to source it on your behalf. Why spend hours trawling through several different sites, when all the domestic kitchen sinks you could possibly desire are right here on one, user-friendly site? Shop with HC Supplies, the reputable stockist, and ensure you receive the quality kitchen sink you want, and the service you deserve. When refurbishing a home abroad, it may be difficult finding kitchen sinks locally that really take your fancy, and if you are an ex-pat settled in Europe, you may even want to bring a bit of UK charm into your kitchen as a constant reminder of home. Our Belfast sinks range can do exactly that and just because we are a UK based company, this doesn't mean that you can't have your purchase shipped overseas to your new home abroad. A traditional Belfast sink could be just what you need to have a piece of home in your new abode abroad, or you may want to embrace your new lifestyle with something completely different. You will find many innovative styles on our site, including the quirky Elbe Round kitchen sink bowl from Bretton Park, and the Smeg Quadra Stainless Steel Bowl. If you spy something on our site that is ideal for your home, HC Supplies, kitchen sinks suppliers, are happy to deliver it overseas (fees apply). Whether you require shipment of your kitchen sinks directly to Europe or beyond, our customer services team will be happy to tackle any queries you may have and to make arrangements for you. Should you be finding it difficult to make a choice, why not discuss your needs and options with a trained customer service adviser? Queries can be asked via our online form, or you can call to speak with one of our team directly. It is helpful to have any relevant measurements on hand so we can assist you further with choosing the ideal kitchen sink for your home. Many of our customers who purchase new kitchen sinks find it comforting to know that not only can they contact us online and via telephone, but they can actually come to our showroom to discuss their needs face to face with a member of our team. You may also prefer to browse our collections in person rather than online, which is why we welcome you to our showrooms in South Yorkshire during opening hours (please telephone before you visit to ensure we are open and to avoid any disappointment). 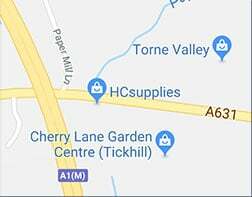 You are also welcome to avail of the free parking which can be found on site outside the MJM Bathrooms showroom, which is home to the HC Supplies showroom. Further details and directions can be found on our site, and if we can do anything to make it things easier, or more comfortable for you during visit due to any disability or need, simply give us a call and will ensure you are accommodated.